Enigma Virtual Box is used for file system and registry virtualization and allows you to consolidate all files and registry keys used by your application into a single executable file without having to extract virtual files to the disk. With Enigma Virtual Box, you can virtualize any types of files, dynamic libraries (*.dll), ActiveX/COM objects (*.dll, *.ocx), video and music files (*.avi, *.mp3), text files (*.txt, *.doc), etc. ...... With Enigma Virtual Box, you can virtualize any types of files, dynamic libraries (*.dll), ActiveX/COM objects (*.dll, *.ocx), video and music files (*.avi, *.mp3), text files (*.txt, *.doc), etc. Enigma Virtual Box does not extract temporary files to the HDD; file emulation is performed in the process memory only. The supported versions of Windows include Windows 2000/XP/2003/Vista/2008 and Windows 7. 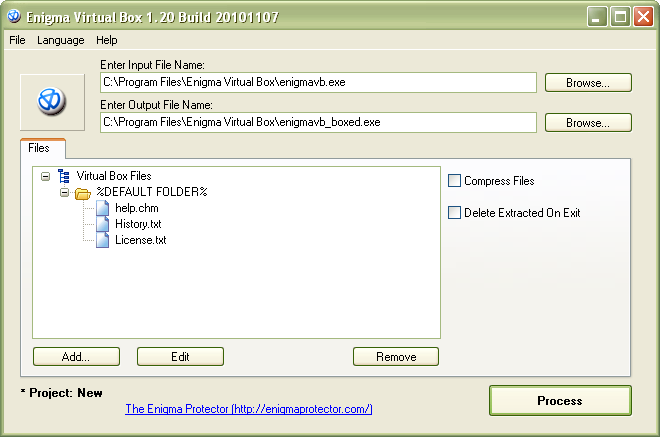 Enigma Virtual Box does not extract the virtualized files to the disk and does not create any temporary files on the user's computer. Enigma Virtual Box supports x86 (32-bit) and x64 (64-bit) binaries that run on all versions of Windows NT. Enigma Virtual Box is an absolutely free application; you do not have to pay anything to use it! Enigma Virtual Box supports any type of files to be virtualized. Enigma Virtual Box allows compressing virtual files, thus, reducing the total size of an application several times. Solve and construct professional acrostics. Qweas is providing links to Enigma Virtual Box 4.70 as a courtesy, and makes no representations regarding Enigma Virtual Box or any other applications or any information related thereto. Any questions, complaints or claims regarding this application Enigma Virtual Box 4.70 must be directed to the appropriate software vendor. You may click the publisher link of Enigma Virtual Box on the top of this page to get more details about the vendor.